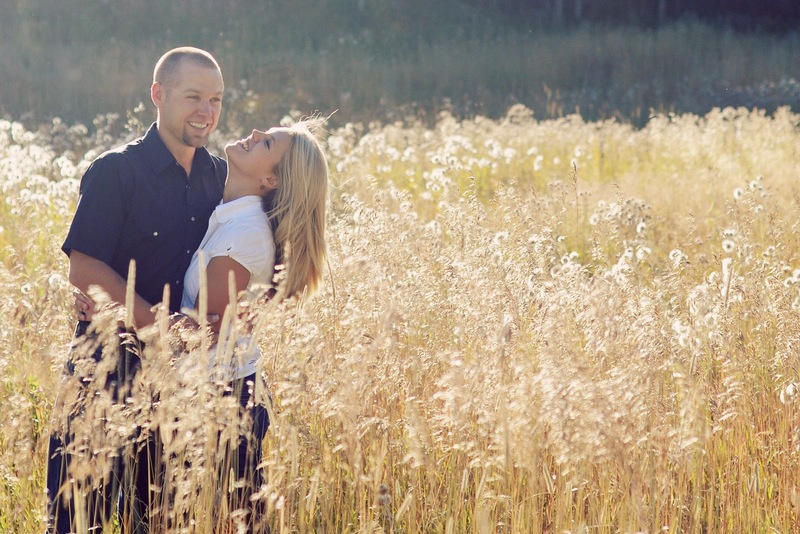 Wedding Wednesday — Beautiful WY Engagements! 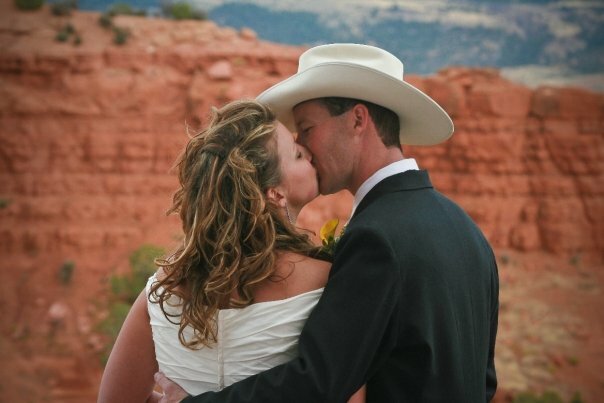 On July 23rd, 2011, Shane and I will celebrate our 7th anniversary by becoming husband and wife. I never dreamed I would find the person I want to spend the rest of my life with already and I could not image my life with anyone more perfect! CONGRATS Keileigh and Shane! It’s so exciting to take one of the most important steps of your life with your best friend. You two look amazing together and we wish you all every happiness! 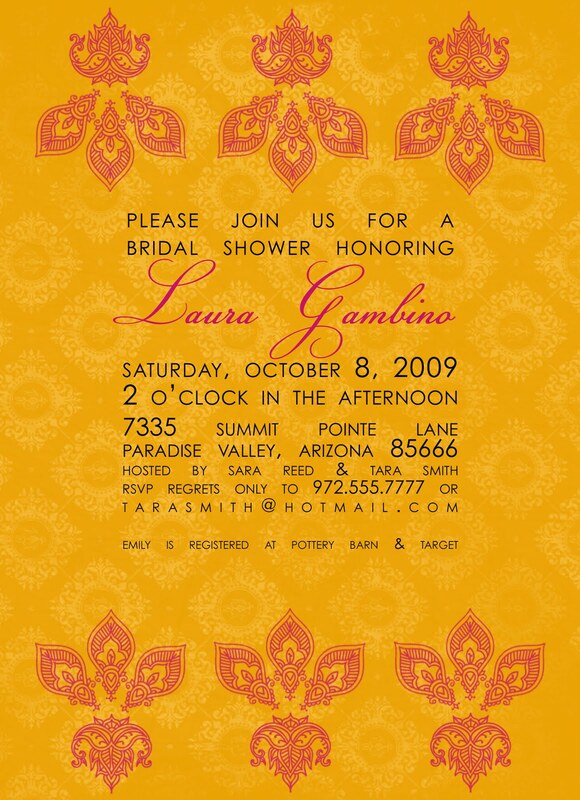 Best of luck on your upcoming wedding! You can find Keileigh &amp; Shane’s announcement, along with other awesome WY couples, on our engagement announcement page (linked at the bottom of this blog post). Want to have YOUR engagement featured? It’s easy! Email us at brides@wyomingweddingsonline.com and let us know! ‘Til Next Time…I’m enjoying getting to meet all of you! 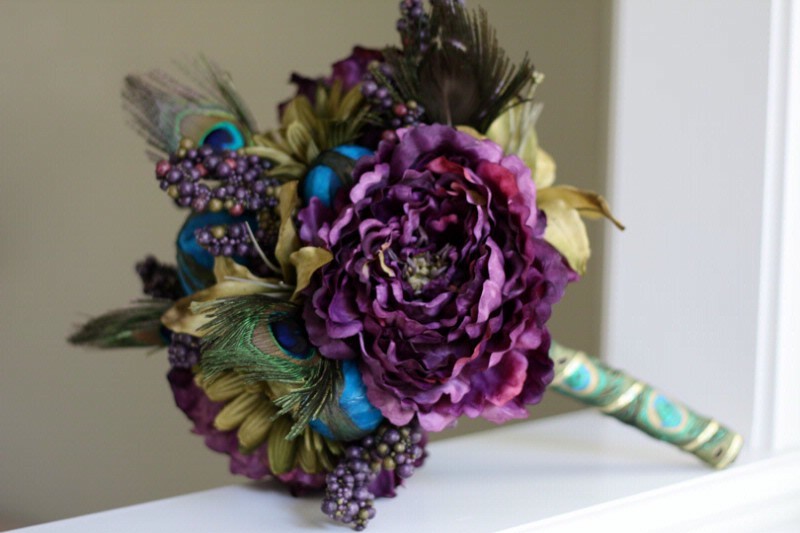 TIP: Double up on your Groom’s Boutonniere. That’s right; buy 2 for him. 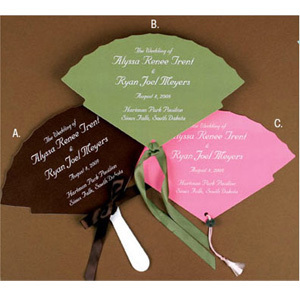 Here’s why – boutonnieres are already prone to dehydration because they will have been out of water 5+ hours before the wedding. Couple the flowers’ dehydration with the bruising and petal loss that will occur when everyone he knows gives him a hug, and you wind up with a broken, bruised and smashed boutonniere that will make your groom look just as bad as it does. Remember that immediately following that receiving line, you will be photographed from all angles as you enjoy your first dance, cake cutting etc. Simply replace his boutonniere after the receiving line to avoid having that sad, dead flower in your wedding photos. Pay all of your vendors, and set aside tips for the band, waiters etc. in envelopes at least 5 days before the wedding. Here are 2 reasons: 1. You are already going to be busy on that day, and they will be working hard. The last thing you need is one more thing to remember. 2. Your wedding day is the happiest day of your life, and likely one of the most expensive. You will not want to spoil the wonderful feelings that go along with your big day by seeing your money disappear and thinking about how much it all cost. TIP: Know your (photography) rights. Most wedding photographers have their contract worded in 1 of 3 ways. 1. They retain full rights to every image they produce. Translation: you can never copy your photographs yourself. Each time you decide you want a print (even a little one for grandma) you will have to purchase it from your photographer. 2. They retain rights to all of the images they produce, but you can purchase the rights, or they may give you rights to reproduce images up to a specified size. Translation: you may have to pay your photographer extra so that you have the rights (they will provide you with a digital or film copy of your wedding photos as well as a signed release form) or you may only be able to reproduce your images up to a specified size such as a 5” x 7”. If you want a photograph that is larger than that it has to be purchased from them directly. 3. You have full rights to your photographs. Print them and send one to everyone in the country if you would like. TIP: Your wedding day is all about you and your groom but remember to honor the people that helped make you the people you are. It often means the world to mothers, fathers, grandparents, step-parents, and others that have affected you deeply to receive a personal flower – a corsage for the women, a boutonniere for the men. Also, don’t forget a personal flower for your officiant; after all, marrying you is both an honor and a solemn obligation. 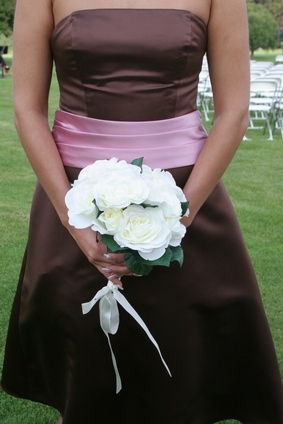 A wonderful way to remember someone special is to carry a locket with their photograph attached to your bouquet. TIP: Create an emergency kit just in case the unthinkable happens. Include things like: safety pins, needle, thread, bobby pins, pain killers, deodorant, blotting papers, spare shoes, eye drops, tampons, hairspray, clear nail polish, band aids, dryer sheets (for static), and duct tape to solve any problem the other items can’t. TIP: This one is for you from my own personal experience: Don’t book a 6am flight for the morning after your wedding. Trust me on this one – fly out in the afternoon, or 2 days after the wedding. 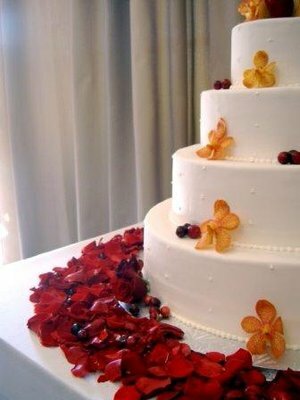 I hope that the planning for your wedding is going wonderfully and I hope the tips here will help you with the process. 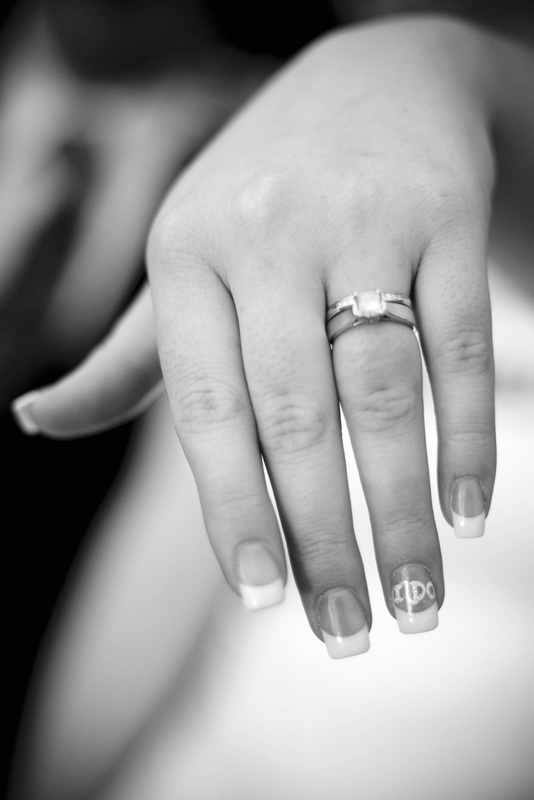 Next week I will continue this theme with My Top Wedding Day Tips… Until then, enjoy being engaged! Thanks Sarah! These tips make me think about how confusing and stressful the planning process can be…are you feeling stressed? Confused? Have questions? We’re here to help! We have a whole team of experts that can help answer your questions! Email us, post on our Facebook wall or reply to this blog — and let us know what we can research for you! ‘Til Next Time…We’re rooting for you!!! 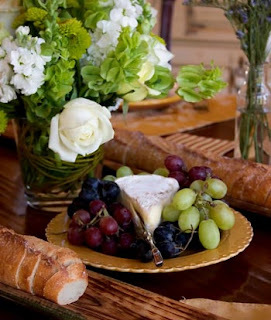 Playing with a fun theme today… French Provencal! A combination of rustic elegance and French details, a little touch of countryside, fruits, wine, cheese…earthy wood tones and elegant lace can combine perfectly! 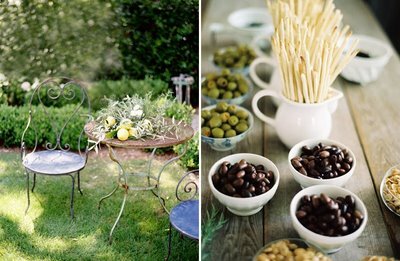 This theme can become pricey quickly, however the feel of Provence can be achieved with inexpensive components too. Use reusable items such as wood cutting boards or pieces of wood in your decorations; scraps of lace to peak out from underneath food trays and cake displays… green glass bottles, white pottery and strands of prairie grass and olives… and other items that you use every day can be collected and incorporated into an easy-going, eclectic design. I found an incredible array of white pottery items at Pottery Barn for an inexpensive price — they make fantastic pinch-hit table centerpieces! Use your imagination — have fun! Your guests will be wowed with your creativity! ‘Til Next Time…Share your fun theme ideas with us! WOW! 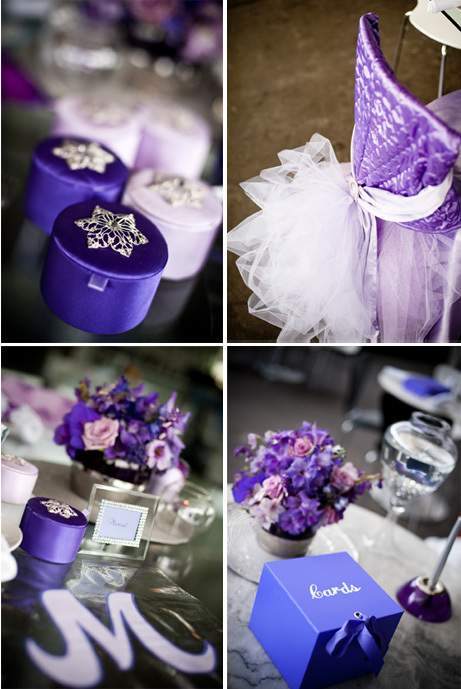 A Wyoming bride shared that her & her fiance’s upcoming wedding will use silk blue &amp; a dark purple for their colors. I must admit I was naive about the term ‘silk blue’ — she replied that silk blue is also called ‘ice blue’, but I have to say that the term ‘silk’ used with any color is sheer brilliance! Talk about adding the element of not only texture, but LUXURIOUS texture to a color description… And when it comes to your wedding, adding texture and a touch of luxury is never a bad thing… Bravo! And thanks for the color inspiration from this bride — I hadn’t come across this color combo yet and I have to say, it is another fun one! www.girlsofelegance.co.uk — Silk blue princess! Love this! FUN! 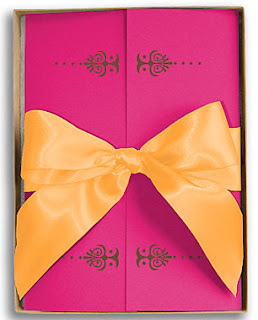 I can imagine the great ideas that one can find from this color palette…bravo! Thanks for this suggestion — and keep them coming! What is your color inspiration? We’d love to share it on our blog! The best part of sharing wedding information is reporting what other couples are using — so share away! 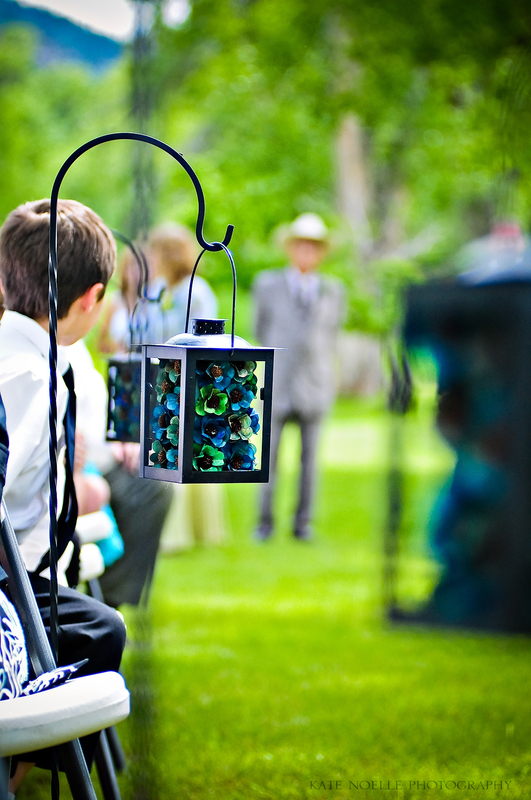 We’re here to serve you and to listen to you and your needs — we are Your Homegrown Wyoming Wedding Resource! 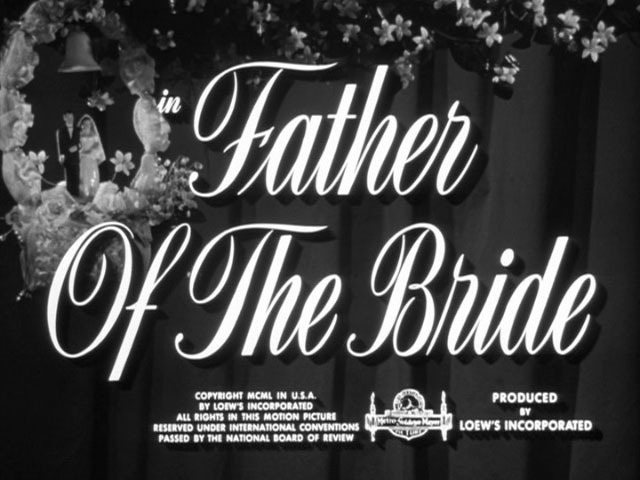 If you haven’t seen the 1950 production of Father of the Bride starring Elizabeth Taylor, you must! It is a charming movie, to say the least. The 1991 version was always a favorite of mine growing up, and when I discovered the 1950 version a few years back, my husband and I had to stay up half the night to watch it. Heels may not be your thing. And that’s totally cool. OR, if you’re like me and suffer from a bit of foot pain as the day progresses (darn my plantar fasciitis from running! ), you need some comfort in your day. 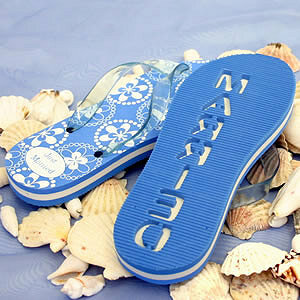 Well fear not — here are some fun FLIP FLOPS that celebrate with you! If you have a Shoesday Tuesday celebration of shoe bling to share, please do so! Doesn’t have to be heels, and definitely DOESN’T have to be designer — just has to be LOVED by you! 🙂 Email it to brides@wyomingweddingsonline.com or post it to our Facebook wall! TRACKING MEMORIES — It’s Important! And Easy, I Promise! What’s the speech we hear about wedding photography &amp; videography? Invest in your day…save those memories…because when the wedding is over, those memories are what remain…and they’re right, of course! So why not apply it to the planning PROCESS as well? Those months are FULL of memories — from the trips to the bridal salon, trying on all those dresses, picking YOUR dress, the alteration appointments, the first time you saw yourself in the mirror… to the floral appointments, catering appointments, to the funny things that happen…they’re ALL worth saving. 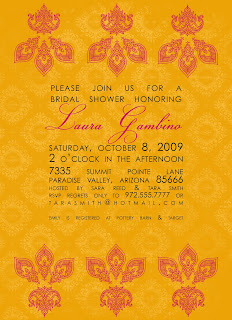 Maybe you’re a DIY girl — that feeling of pride and satisfaction when you saw your completed pile of wedding programs sitting in front of you is a moment to treasure… Or maybe you’re NOT a DIY girl, and the feeling of relief and excitement you felt when you met with your planner and she said ‘We’ve got this ALL taken care of for you, and it will be PERFECT!’ — another moment worth savoring! No matter your style, keep those moments — they will be fun to relive later, AND fun to share with your children or other family someday! I’m a journaler. Yes, that’s not a word — but it’s who I am. However, between running two magazines, two children, running daily and volunteer activities, journaling is hard to do at best. So for me, I keep it to the big moments — and those that I can’t miss remembering. Writing several pages can be time-consuming — so don’t do that if you can’t! Jot down the big details — they’ll still represent that memory perfectly. Two months later, I returned, not exactly sure what to expect. You know what? She was RIGHT! It fit like a glove, and looked absolutely perfect. That time, tears flowed freely — but for a different reason! This memory wasn’t 100% positive, although the ending was perfect (fortunately!). It was important for me because my illness affected our wedding planning in many ways. Keeping a track of those memories for me was just as important as the beautiful decorations on our day. 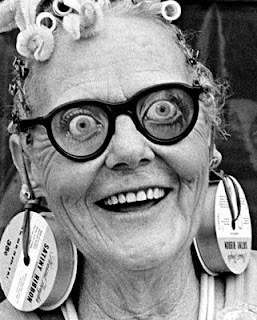 A way for me to keep that memory in short-hand form could be: “June 2000…Dress is in…I was so nervous, but it FIT! This is amazing! I was a puddle of tears — I’m SO excited that they saved my dream wedding dress!” Memory is saved, and it took about five minutes to write — and you conveyed the important information! 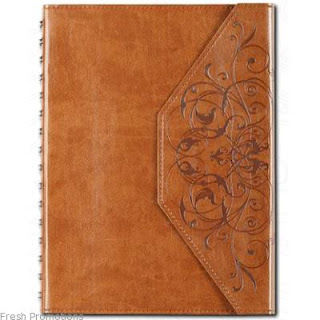 Find a journal that you love at the book store, stationary store, or specialty store — there are many independent stores in Wyoming that carry beautiful journals. Another person that can journal? Your groom! You might just be surprised what he’ll say if you ask him. Men may not be into details typically like we are, but encourage him to write shorthand — those memories will be just as important in the future as yours! One more time that I highly recommend you journal: Your Wedding Day. It was a crazy day, but one thing my husband Levi and I did was write a quick letter to each other on the morning of our wedding day. We wrote in our journal, and had a friend deliver it to the other one (because we were pretty traditional about not seeing each other before the wedding). It didn’t take long, and we were able to share our feelings of anticipation and excitement (even nerves) with each other. Now it stays in our journal and is a reminder of our feelings for each other on that day…always a great boost to your relationship when you need one! I do enjoy an elegant black &amp; white wedding, but OH BOY do I adore pops of bright COLOR! The trends for 2011 are leaving me feeling all warm and fuzzy, and today’s color inspiration is no different — RASPBERRY! I LOVE this one — of course, I am also in love with rosette pins. 🙂 This next one is a fun and flirty take on rosette pins and raspberry…I think it’s a very taste-specific dress. See what you think — I’d love to hear your opinion! www.kenziekate.com — “Vienna” — J’adore!!! www.lilliebarn.blogspot.com — Oh so happy!!! 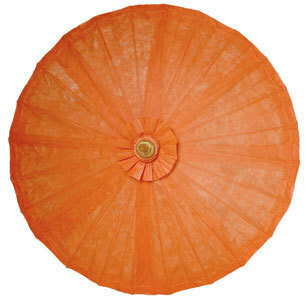 www.ioffer.com — Think drink umbrellas! Instant pop, ambience and fun! 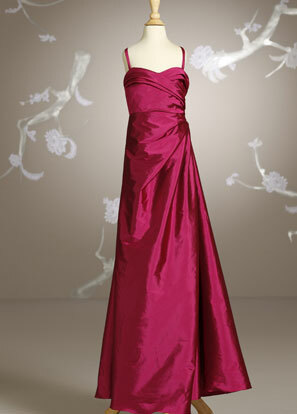 Do you have a color inspiration suggestion? We’d love to hear from you! Email us at brides@wyomingweddingsonline.com and share your color inspiration with us — you might be featured in this blog! ‘Til Next Time…Keep that Inspiration Coming! Clever, no? OK, more like cheesy. Yes, agreed. 🙂 Obviously your guests are more than just GUESTS, they’re your biggest cheerleaders in life: your friends, family, former teachers and coaches and Girl Scout cookie-selling buddies and teammates and co-workers. People came for more than a free meal — they came to support you! So I thought that the idea of FANS for programs was not only AWESOME, it was very ironic! Talk about multi-tasking brilliance: inform your fans of the program, give them some entertainment, AND keep them cool all at once! 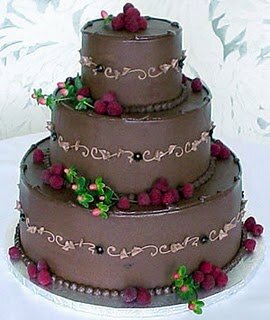 I am a HUGE fan of multi-tasking — I prescribe by Alton Brown’s theory that ‘The only uni-tasker in the kitchen is a fire extinguisher.’ Multi-tasking is a woman’s best friend, and start off your multi-tasking life with giving your fans one at your Big Day. SUPER cool! You can design your program yourself or talk to a stationary maker, print shop or friend who’s Photo Shop/In Design savvy about designing your programs for you. 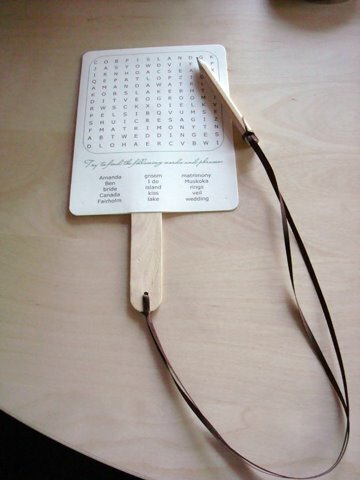 Print them on cardstock — either two individual pages, OR check into printing two sides onto one long piece of cardstock, such as an 11×14…fold in half and secure around the handle. Super easy! 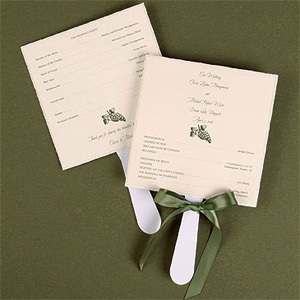 These are AWESOME ideas — talk about a fun twist on wedding programs! ‘Til Next Time…I am finding the CUTEST stuff to share with you! 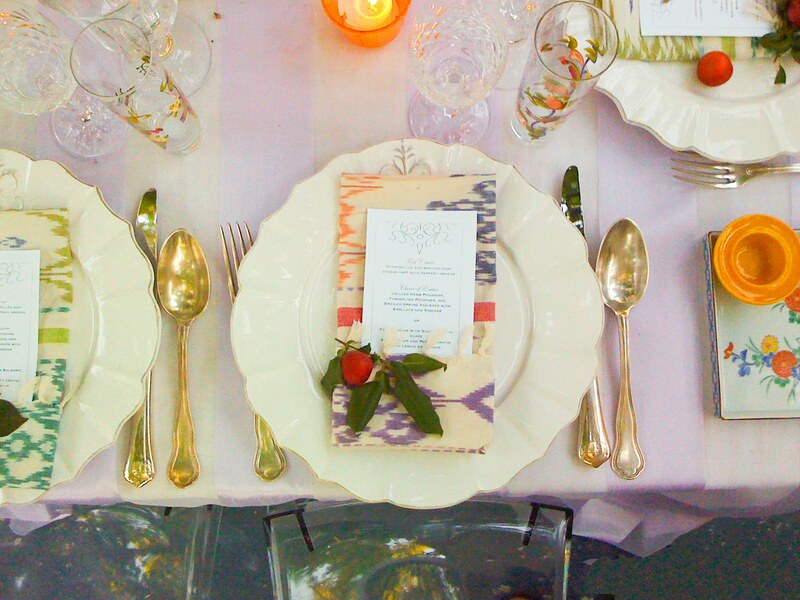 Sarah Merrill of Suite Blooms in Cheyenne is back with another awesome blog! 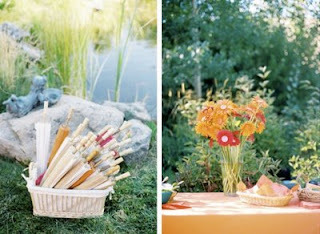 Check out these SUPER FUN centerpiece ideas…I just adore her awesome ideas…Photography is provided by Sarah Merrill. Just to catch you up, my last blog post was about your centerpieces – more specifically – how to save money on your centerpieces. If the three ideas I presented a couple weeks ago weren’t enough, don’t fret, because this week’s blog is a continuation! 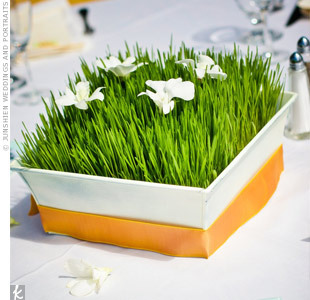 We will kick this blog off with a look that is fresh, earth friendly and economical – Wheat Grass! You may have seen this stuff before at your local juice bar where it is juiced and then drank like a shot of whiskey (only stronger). What makes this an awesome centerpiece? 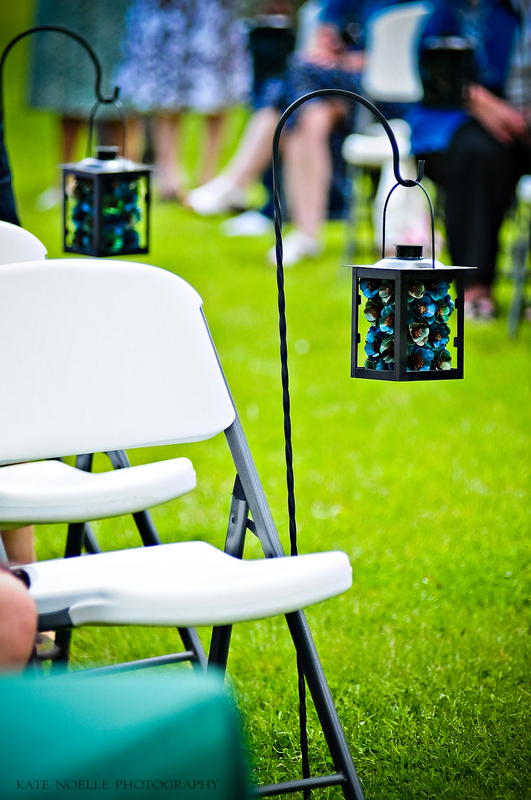 Here are just a few of the reasons: it brings the outdoor feeling inside your venue, it’s vibrant, it can be cut to fit almost any container, and because it’s low, it will not block your guest’s view. 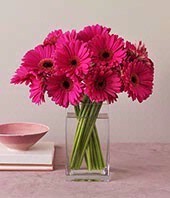 Then just add a few Orchid blooms, or have your florist “plant” a few water tubes containing a single Gerbera Daisy each to complete the look. 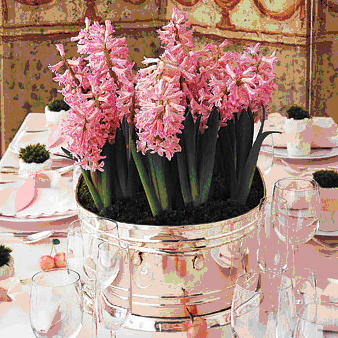 Potted plants make beautiful centerpieces and are less expensive than cut flowers because your florist will not have to spend time arranging them. 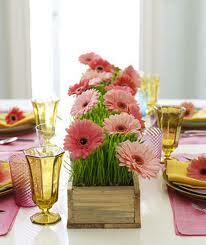 Your options are seemingly endless when choosing potted plants or flowers for your centerpieces. Two things to keep in mind are the season and formality of your event. Bulb flowers like Hyacinths and Tulips are colorful and can be displayed in a variety of containers such as a clear vase with the bulb and roots showing as pictured below, enamel cookware, or even a lined wicker basket. 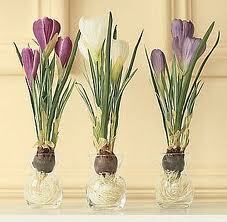 These spring blooms would be perfect at an informal brunch wedding, or at a laid back evening reception. 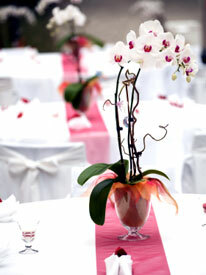 If your wedding has a more formal feel, try using Orchids in an elegant glass or silver container. Flowers grouped together “en masse” are wonderful for showcasing the specific shade and texture of an individual flower. Take Carnations for example. These flowers, when arranged tightly together in an interesting footed bowl, go from ordinary to exquisite and have the versatility to go from a ranch house reception to a grand ballroom just by switching out that quaint footed bowl for a tall, slender vase or pedestal dripping with crystals. 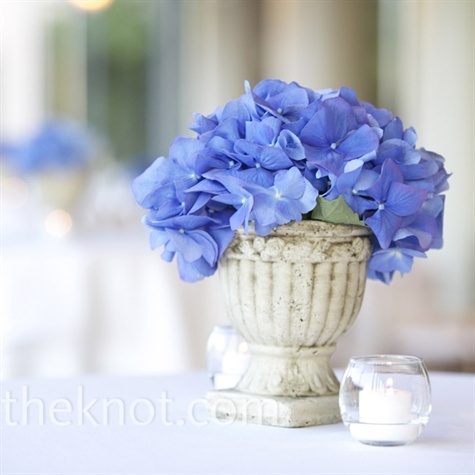 Hydrangeas are also an ideal flower for an en masse style centerpiece because their florets are already arranged into a gentle cloud-like group. An arrangement of just three stems in a mason jar or simple vase is a sweet centerpiece that your guests are sure to admire. Babies Breath is a simple little white bloom that was once thought of as strictly a filler flower, but now it’s been given new life and stands alone beautifully. 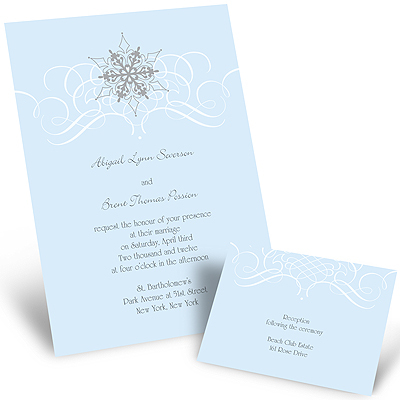 It’s fluttery little blossoms are reminiscent of snow flakes, which makes these perfect for a winter wedding. 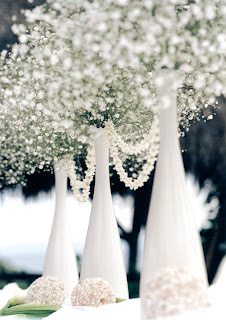 Group together 3 milk glass vases filled with Babies Breath and tie them together with tiny garlands of White Hyacinth Blooms to really make an impact. Think of it as bringing the snow inside! Thanks for reading! 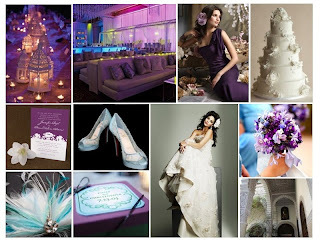 Next week I’ll be giving my top five suggestions that apply to every wedding – including yours! 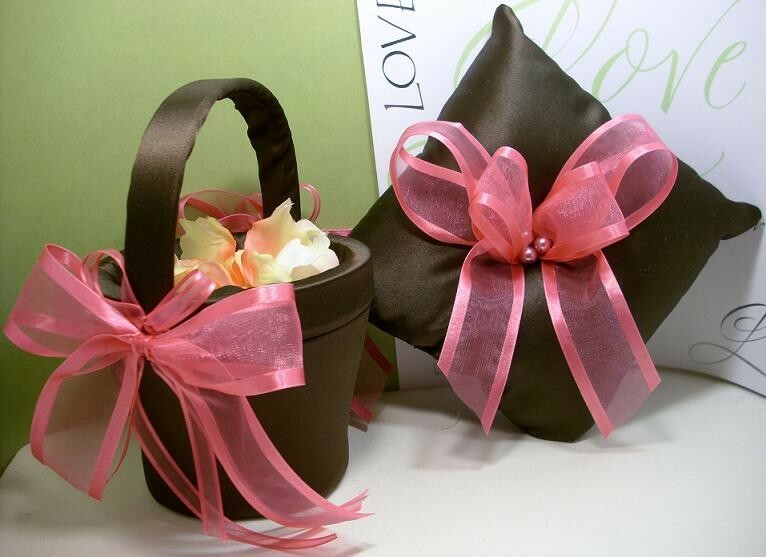 Until then, you are warmly invited to visit me on Facebook @ http://www.facebook.com/#!/pages/SuiteBlooms/272721623120. You are also welcome to send me your floral and décor questions – your question and my answer could appear right here! Thanks Sarah! I look forward to Sarah’s next blog — she has such fabulous ideas! 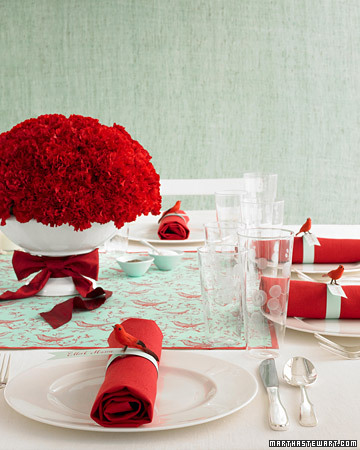 ‘Til Next Time…I’m loving those Carnations…I never thought of them arranged like that! Hmmm, has it really been since Wednesday when I was here last?! Good grief! Well, my apologies — I have been on the road this past week, delivering the newest copies of Wyoming Lifestyle Magazine to a few more communities across Wyoming. But I’m EXCITED to be BACK, because I ADORE finding new material for this blog!!! 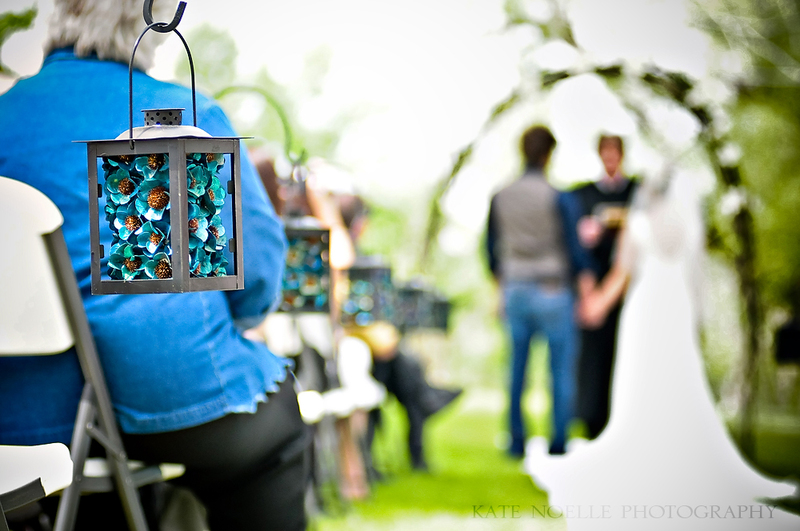 Think double-duty on ideas like this too…use lanterns like these shown above during your outdoor ceremony, then take the posts and all to the reception and stick them in the ground outside your tent — swap the flowers for some candles and voila! Instant ambience! Now, if your reception facility has a rule against candles (especially in late summer when we can have fire hazards in Wyoming), think about those new battery-operated, flamless candles…many come in variable sizes! LED lights might be another flame-less option! ADDED NOTE: If you read this already but are checking back, we discovered another fun way to incorporate lanterns into your ceremony: with a cushy bed of moss, lay your rings (or the faux rings you’d typically put on a ring pillow) and give it to your ring bearer to carry! AWESOME idea — FUN twist on the ring pillow idea! 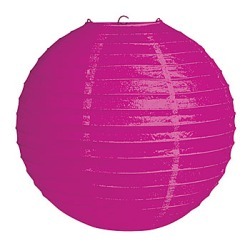 Til Next Time…Keep thinking of those ways to expand both your budget and your design savvy…I Heart Lanterns! What a brilliant idea!